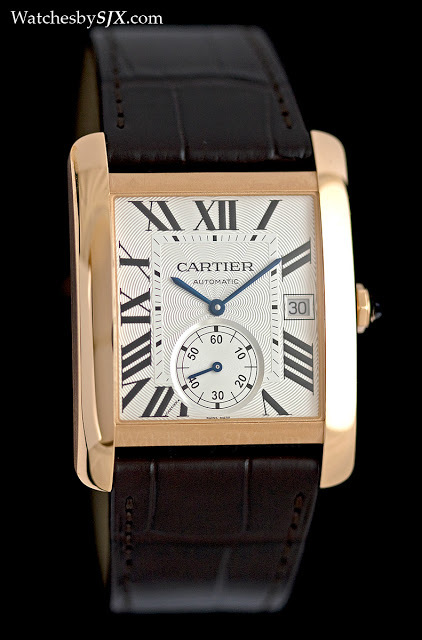 Cartier recently unveiled the Tank MC, equipped with the in-house 1904 MC movement. 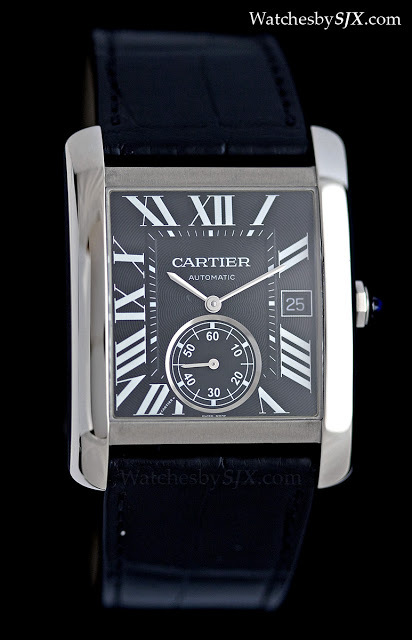 Larger and more masculine than earlier versions of this iconic model, the Tank MC is also an accessibly entry into Cartier's in-house movements. 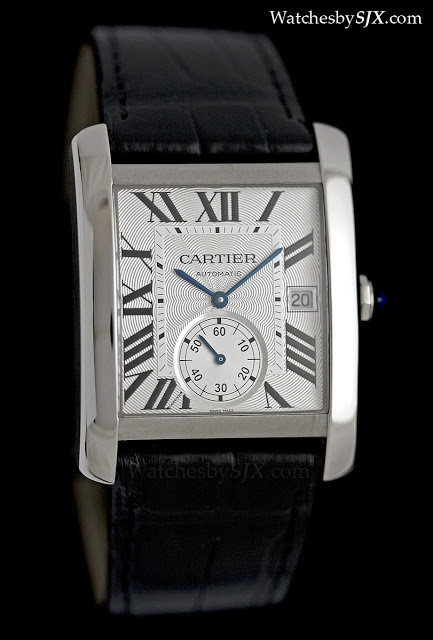 Over the nearly 100 years it has been in existence the Cartier Tank has been available in a multitude of forms. 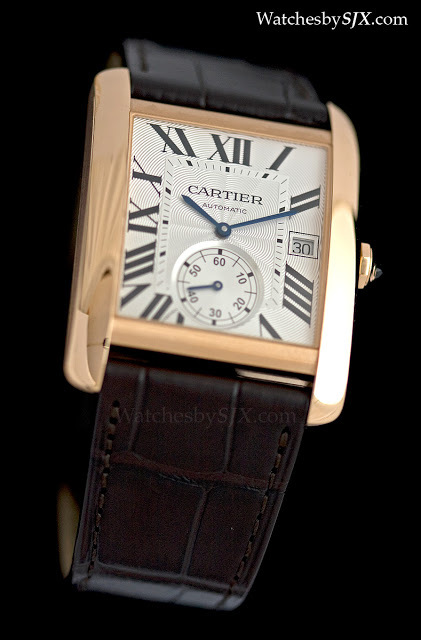 But regardless of style each has retained the classic Tank shape, arguably the most recognisable rectangular watch ever. The Tank MC – the first Tank wristwatch designed expressly for men – is the newest addition to this storied line of timepieces. 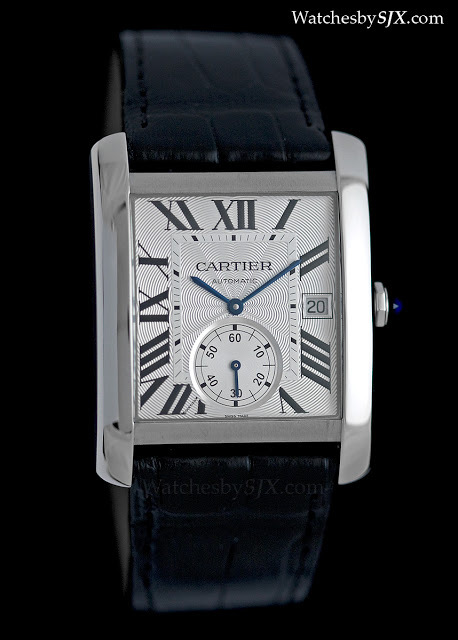 The Tank MC is actually an evolution of the Tank Americaine, itself descended from the Tank Louis Cartier. 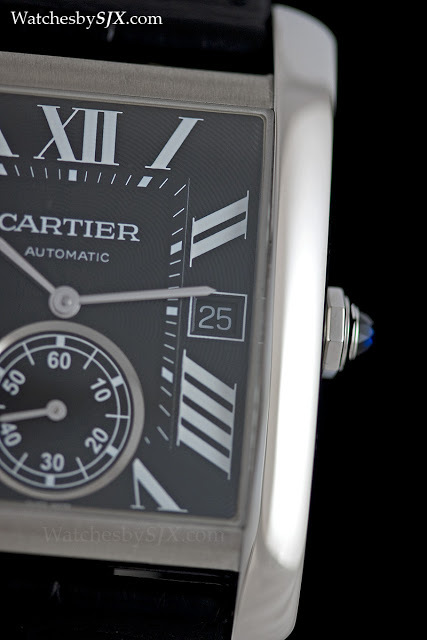 At 34.3 mm wide and 44 mm long, the Tank MC is one of the widest Tank wristwatches ever designed. 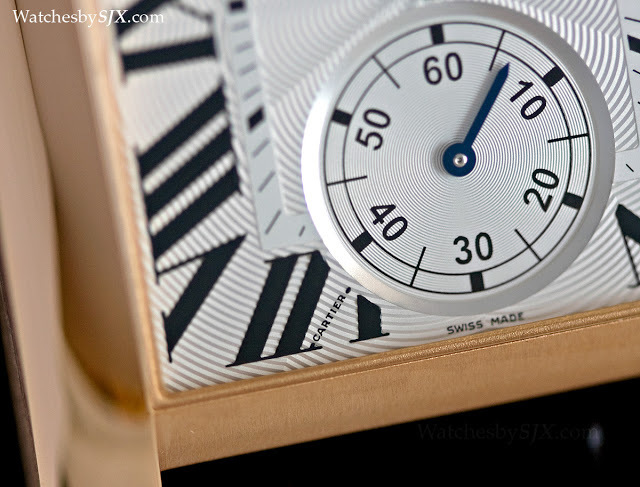 And unlike the typical, elongated Tank watch, the Tank MC is slightly squarish in shape. 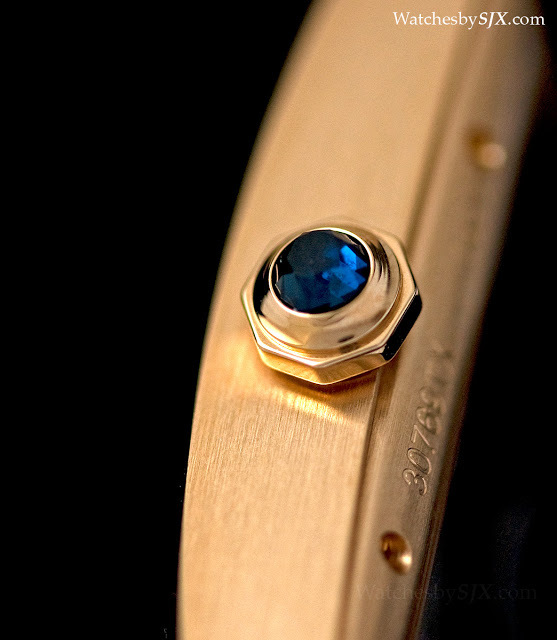 But it is not overly big or thick, and with a height of 9.5 mm, maintains an elegant profile on the wrist. Equipped with the 1904 MC-PS movement – PS means “petite seconde“, or small seconds – the Tank MC is the first entry level Tank watch with an in-house movement. 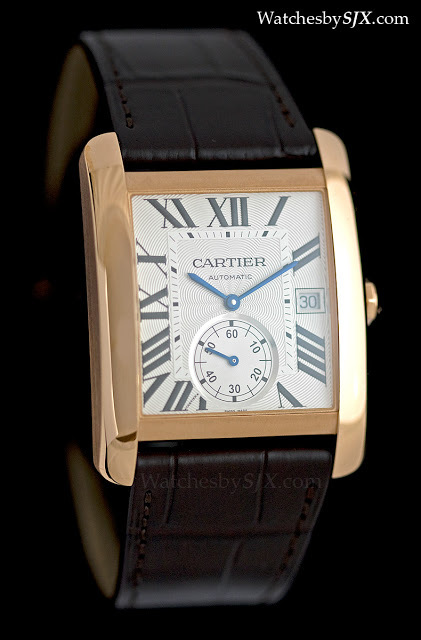 This is derived from the 1904 MC first used in the Calibre de Cartier, with “MC” short for “Manufacture Cartier“. The 1904 MC-PS can be examined through the display back and offers no surprises. It is attractively and appropriately finished, but not lavishly so. 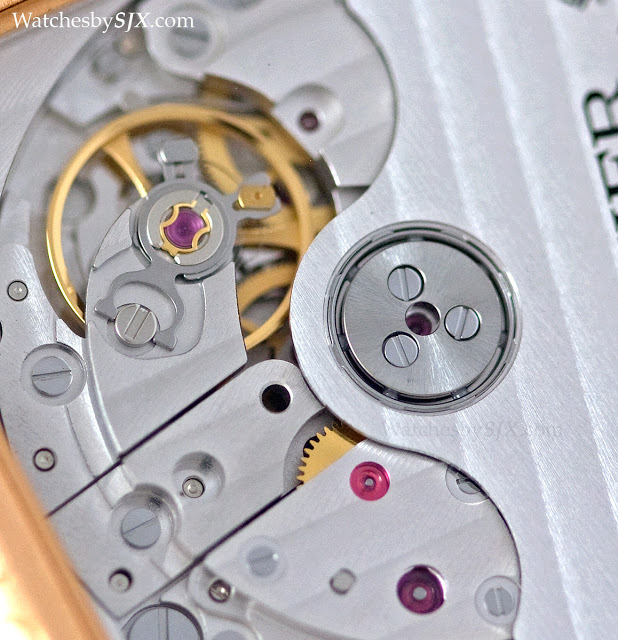 A more elaborately decorated movement would be welcome, but at this price segment this level of finishing is the median. With a twin barrels for optimal torque, and an efficient “Magic Lever” winding mechanism, the 1904 MC-PS is a reliable calibre designed to be a workhorse suitable for additional complications. 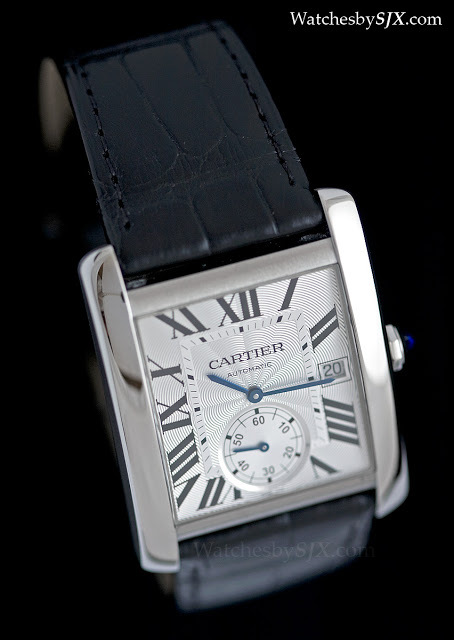 Though this is a new version of the Tank, it is classic Cartier in style. 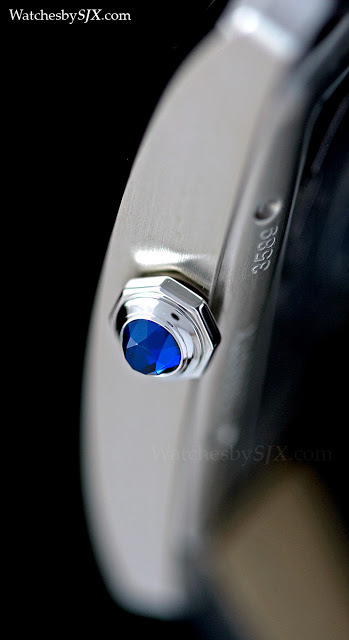 The dial is guilloche, with Roman numerals and sword-shaped hands, and the crown is of course topped with a blue sapphire. 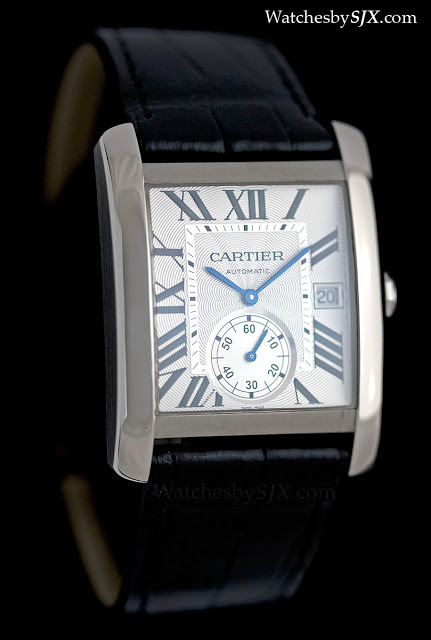 Look closely at the “VII” and the Cartier secret signature reveals itself in the “V”. 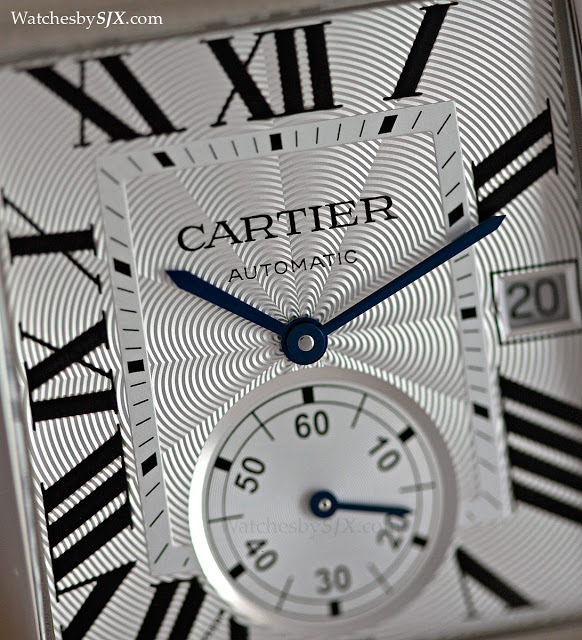 Originally intended to deter counterfeits, Cartier’s secret signature is almost always in “VII”, though in some models it is integrated into “X” if “VII” is missing. 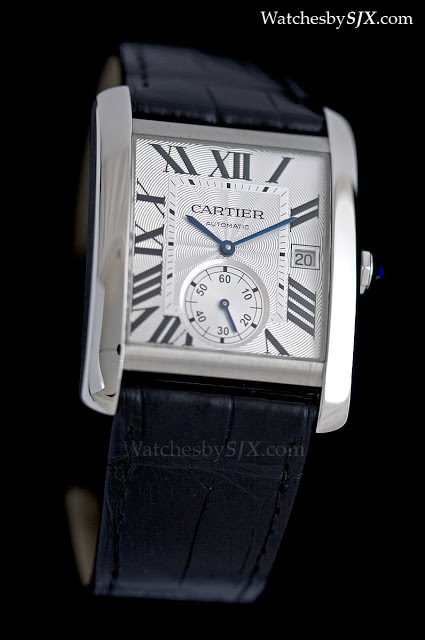 That being said, the date and subsidiary seconds are distinctly modern elements, in fact I believe this is the first Tank wristwatch ever to have a sub-seconds. Recessed slightly and framed by a ring, the seconds sub-dial is slightly incongruous in terms of its contemporary styling and font. 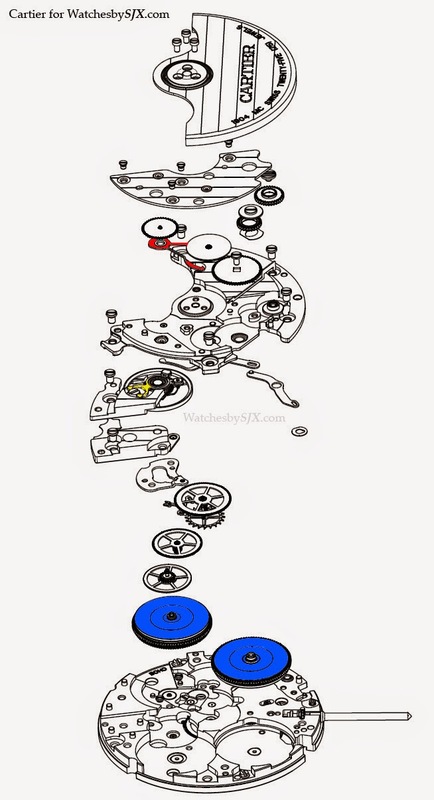 While date windows typically mar excellent designs, in this case the date is fairly well integrated; notably for the dark coloured dials the date disc is in same colour as the dial. 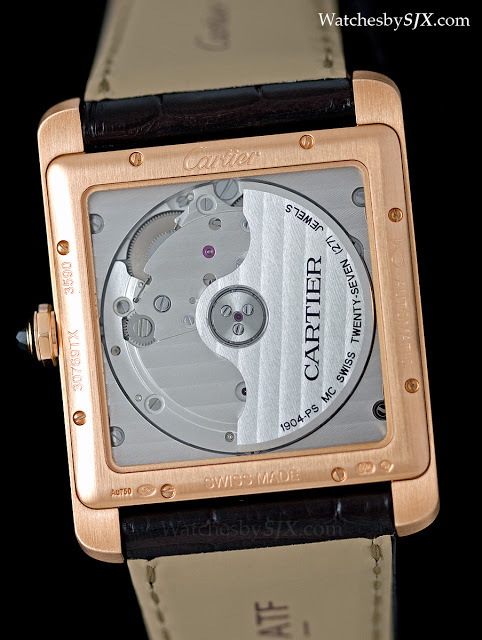 The case is finished like most Tank watches – the tops of the brancards are mirror polished while the sides are brushed. And the portion in between the lugs is brushed as well. 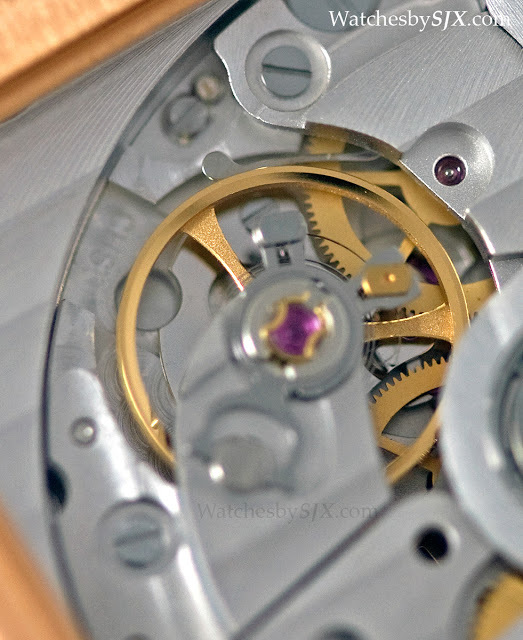 Though finished to a high standard, the case is not exceptionally complex in style or construction. 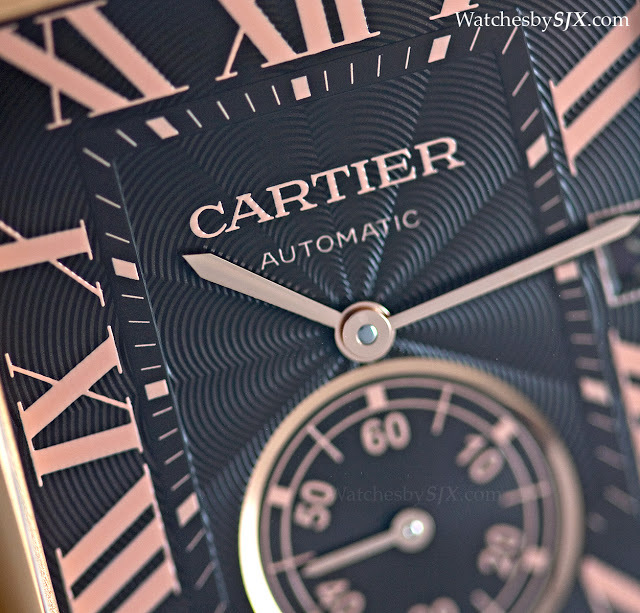 The Tank MC is available in rose gold or steel. 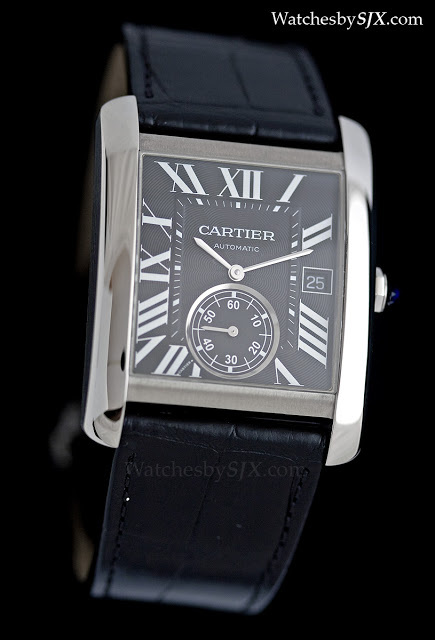 Both versions are available with the classic silver dial and blued steel hands. 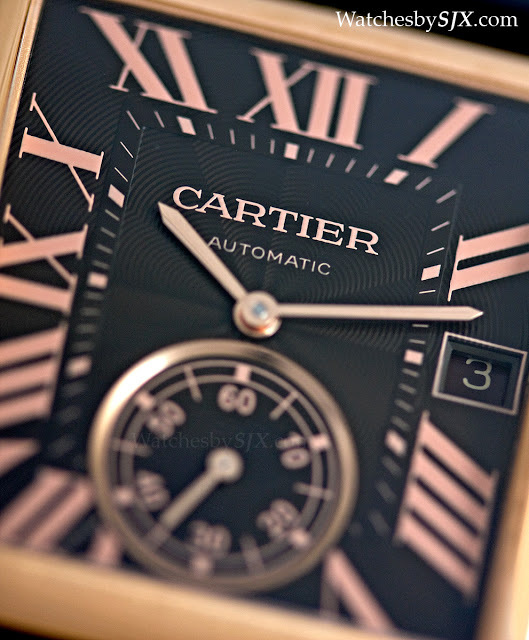 Additionally, the rose gold is available with a chocolate dial and pink-hued numerals. 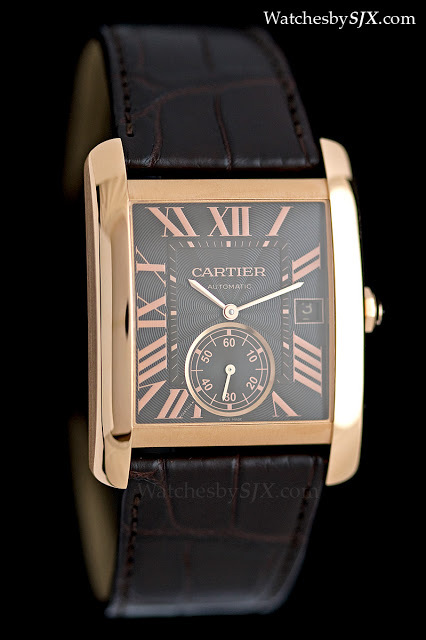 This is the most feminine of the range in my opinion. 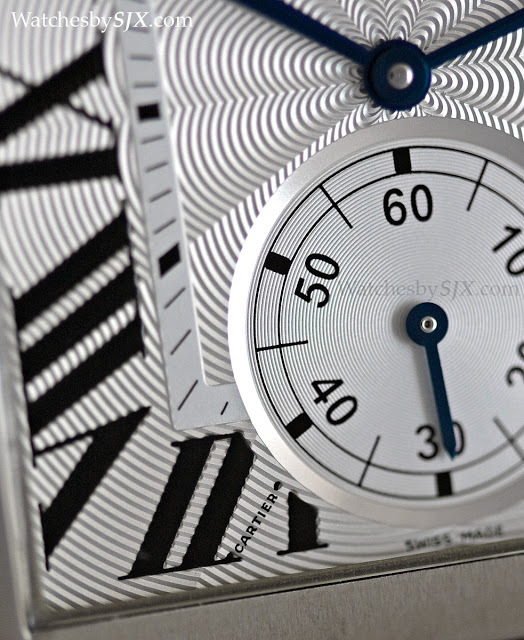 And the steel is also available in black with white numerals, which is the sportiest version. 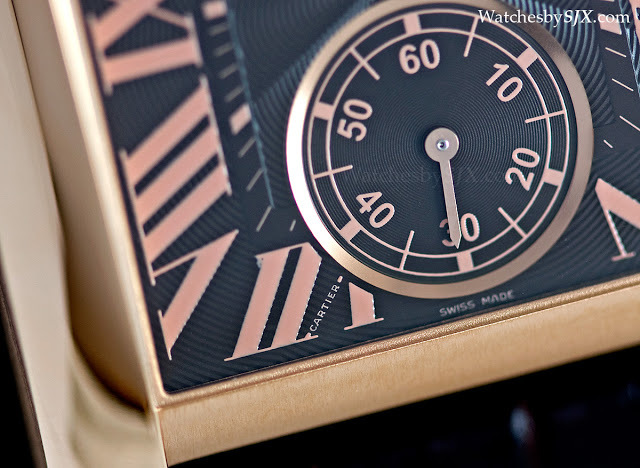 The modern elements of the dial, namely the sub-seconds and date, work best here; they fit in perfectly. 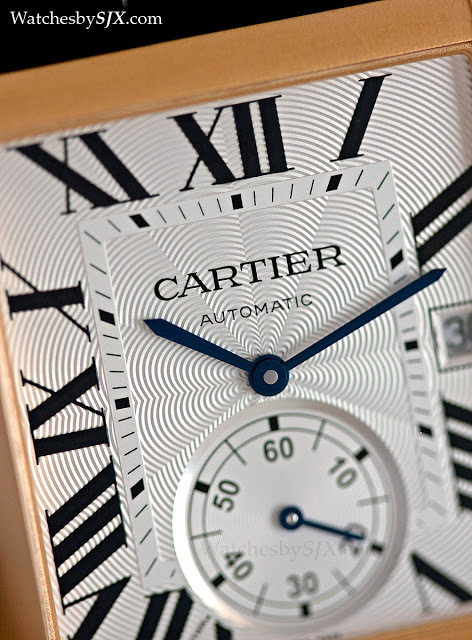 Cartier has done a good job in refreshing what is an amazingly long lived design. 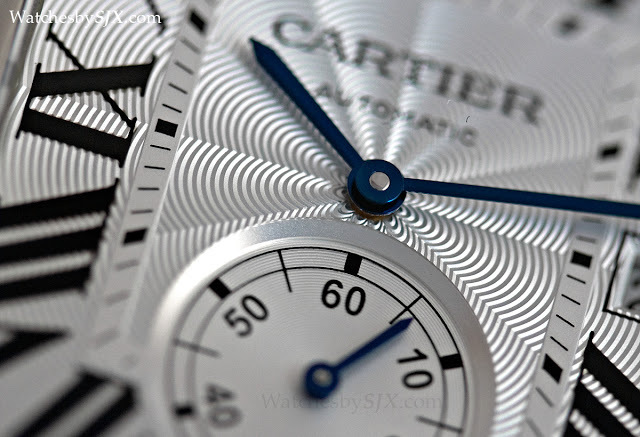 More importantly, the quintessential Tank aesthetic – which is largely perceived as a ladies’ watch – has been retained while making the watch more masculine. 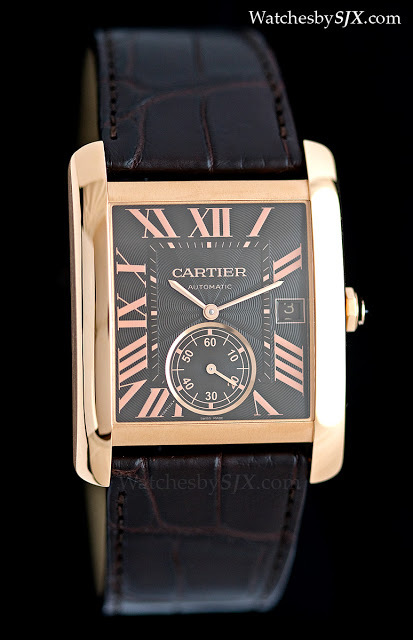 In Singapore, the steel model retails for reasonable S$8400 (~US$6600), and the rose gold version is S$26,500 (~US$20,900). Both prices include 7% tax.